You can't completely stop living your life and there are bound to be some occasions where drinking could come into play. So, make this Low Carb Mojito to enjoy in a classier way without totally screwing up your diet! 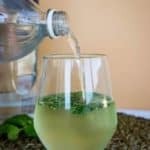 We use fresh mint, replacement sweeteners, vodka and club soda to make this quick and simple keto friendly cocktail! It's great for hosting, date nights and even just after a long day at work! A classic mojito uses rum, but being that Matt and I aren't fans of rum, we decided to go the route of a vodka mojito, and trust us, it is better! Aside from the alcohol it is a very simple drink to make - some simple syrup, mint leaves, ice and top off of club soda! Clearly, simple syrup isn't low carb enough to make this drink keto-friendly, so we had to change things up a bit. We tried making the simple syrup, but found the best way to replicate the sweetness in a classic mojito was through some powdered erythritol and stevia drops. Now, you can make this low carb cocktail in under a minute without having to go through the hassle of making a syrup on the stove top! What can I drink? We get this question a lot! Our go to when we are looking to stay as low carb as possible is always liquor, and in particular vodka. We'll mix vodka with Zevia, diet soda, some seltzer water and lemon wedges or any sugar free drink you can find at the grocery. The liquor of choice is strictly personal, so if you are more of a whiskey or tequila drinker, go for that! You can also enjoy wine if you have a little more room to play with and you don't want to drink an entire bottle. Most drier wines are around 4-5 carbs per 5oz glass so if you go the wine route just be sure to keep track! We all know drinking often leads to loosened inhibitions and an increase in appetite! Boy, I remember the days of getting late night, drunken pizza or Chinese food - those were the days! But, you can still indulge after a couple drinks in a low carb way. If you're more into sweets you can make our chewy chocolate chip cookies, but if you're more a savory type like me, you may just want to make our butter chicken or low carb pizza! Food always comes secondary to drinks in our house, so go ahead and make yourself a low carb mojito to start any night off right! Add mint leaves, erythritol and lime juice and wedge to the bottom of a class. Using the bottom of a wide spoon or something to muddle, muddle all three ingredients together (squish them around to release the mint flavor and combine the lime juice and powdered erythritol). Add the ice cubes and top off with vodka and club soda.